When students are so incredibly talented there is a way of ‘giving back’. The Brookdale residents are some of the best audiences we’ve ever had! This is not a high pressure event, rather a chance for students to put a new piece they’ve been working on in front of a positive and encouraging audience. I know we have talked to some students and parents already about this. 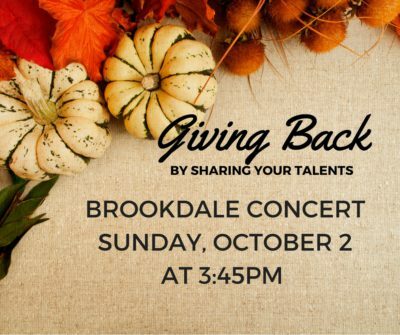 We have an upcoming performance opportunity at Brookdale again Sunday, October 2nd at 3:45pm. This performance is optional and strongly encouraged. We usually start with students performing one piece for time restraints. Parents and family are also welcome to attend this performance. The Brookdale residents absolutely love when the students perform. We’ll have a sign up sheet for the students in lessons. We are so proud of everyone and their hard work! We know how busy everyone is and the fact that the students set aside time to practice and improve speaks so much about them. We are so proud to have each and every one of you in our studio. Please remember to practice even when there’s no motivation–you will soon start to see your wonderful improvement and so will the rest of the world. Your rewards are coming. 🙂 Paul and I only have the student’s best interests in mind and want them to improve and be able to reach all of their goals in life. Practicing for lessons takes a special skill because there are not necessarily ‘deadlines’ like there are in school. It teaches students to be self motivated and do things on a daily basis to make improvement–this skill will benefit them for the rest of their lives! Congratulations. It can be difficult and everyone is doing wonderfully!